AO Smith is one of the oldest and most trusted globally recognized water heating manufacturers. Though this brand is more than 140 years old, its India’s presence is just a decade old. It was the first American water heating company to enter the Indian shore when it ventured into the Indian markets in 2006. 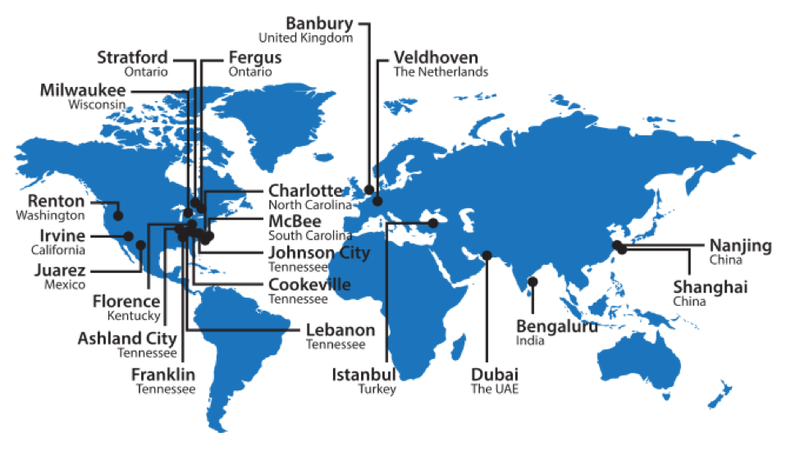 With its presence across 60+ nations, AO Smith is arguably the most popular water heating brand worldwide. This leading water technology company is known for its integrity, innovation and customer service. AO Smith has been mass-manufacturing water heaters since the 1930s and has pioneered the usage of glass lining in water heaters. This speaks volume of expertise AO Smith has. AO Smith produces a variety of water heaters for residential as well as commercial users. From instant to storage from horizontal to vertical, AO Smith offers a good range of geysers for residential users. Apart from the conventional heaters, AO Smith has come up with Air2heat geysers—a new class of heater. It helps to sharply cut down the electricity consumption. It also comes with quite a few useful and innovative features with an appealing design. For industrial and institutional users too it offers decent options for selecting appropriate heater. This includes heat pump, dual fuel and solar heaters. In this article, we will brief you about various types of geysers, their new technologies, and prominent features. Instant and storage are two types of conventional water heaters from AO Smith. Instant water heaters, as the name suggests are designed to deliver warm water instantly. Having a minimal storage capacity (3 litres in case of AO Smith), they can heat up the water really fast. Latest EWS series of AO Smith’s heaters come with 5 years of warranty on the inner tank and 3 years of warranty on the heating element. Storage water heaters, on the other hand, are meant for big families; needing a larger volume of warm water for bathing. AO Smith comes with a variety of water heaters. New storage heaters come with a capacity starting from 6 litres all the way up to 70 litres. Storage heaters come with 2 years of general warranty with up to 7 years of warranty on the inner tank. Scale, sediment, residue builds up on the surface of the heater tank over time due to the hard water. This can lead to the premature breakdown of the geyser. To counter this pestering problem, AO Smith, backed by a decade of experience, has introduced Blue Diamond Glass Coating in its new series of geysers. This offers superior corrosion resistance compared to the ordinary glass-lined geysers. Also, the heating element of modern geysers comes with the glass coating to combat corrosion. AO Smith holds the patent for this breakthrough technology helping to improve the life of the inner tank substantially. That’s why AO Smith is giving mammoth 7 years of warranty on its elite range of storage heaters equipped with this technology. Premium storage heaters like HSE series comes with modern features like the digital display and remote control. Vivid yet intuitive, digital display not only shows temperature, but also the energy consumed by the heater. This will help the users to better assess how much energy is being consumed for their heating purposes. The best part is the wireless remote control which allows the user to set the temperature in the range of 25oC to 75oC. Thus, users get the complete liberty to set the optimum water temperature according to their requirement without needing to mix cold water to balance out the correct temperature. Modern AO Smith geysers come with comprehensive protection from corrosion, temperature, and pressure. The tank of AO Smith’s heater comes with an anode rod which has stainless steel core specially designed to protect the tank from corrosive elements. It uses a special cathodic action to protect from rusting. Premium heaters are armed with digital thermostat. It monitors the water temperature and if the temperature exceeds the permissible level, it cutout cuts off the power supply to assure safety. There are times when supplied water to the heater comes with an enormous pressure, especially in the high-rise buildings. AO Smith’s geysers come with the safety valve to avert the high pressure from damaging the geyser. The valve is designed to automatically relieve pressure and discharge water if the pressure overshoots the predefined limits. AO Smith has been the forerunner in coming up with the pathbreaking developments through class-leading innovations. AO Smith’s Air2Heat heater is the result of that. This new and promising concept heater works differently compared to the conventional heaters. Air2Heat models generate heat from the environment. It uses electricity to transfer heat from one part to another instead of using it to heat the water. Air2Heat heaters work like a refrigerator in reverse order. 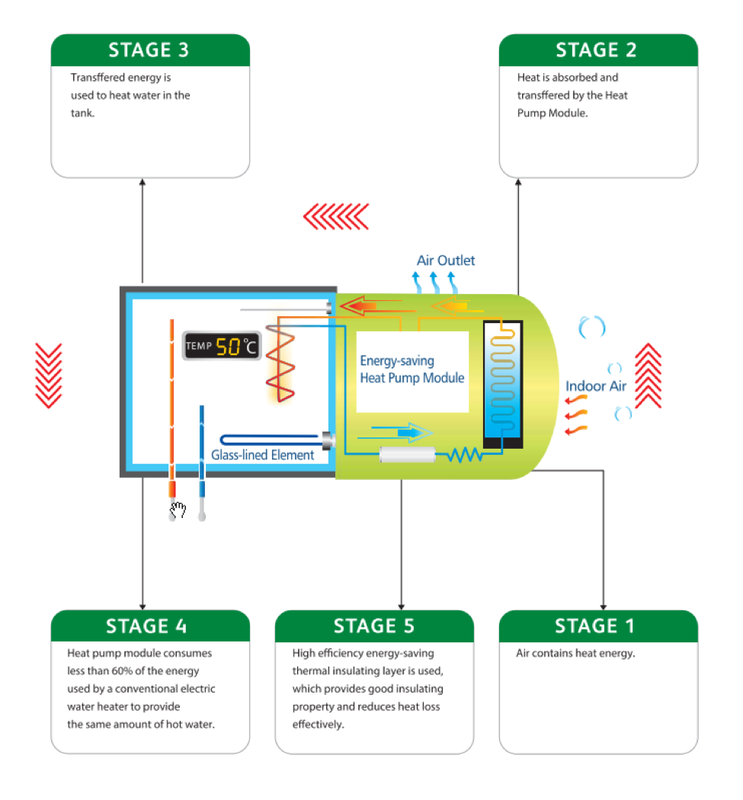 While a typical refrigerator throws the heat from the refrigerator to the ambient surroundings, Air2Heat models pull in the heat from the surrounding air and then simply transfer it to the tank for heating purposes. For each unit of electricity consumed, Air2Heat heater generates 2.3 units of heat energy. This way it is designed to save up to 60% of electricity compared to ordinary heaters. Air2Heat models come with a built-in digital display to succinctly show the key parameters. These include Modes, Timers, Temperature, Hot Water Quantity, Power Off Memory etc. They come with a smart Adaptive Energy Saving (AES) feature which analyzes user’s water heating usage patterns and adopts the heating cycles as per user’s habit based on this observation. To simplify, suppose a user takes a warm shower for 10 mins every day around 7:00 am in the morning, an Air2Heat heater using its AES feature would study and adapt itself to heat the requisite amount of water just a few minutes before 7:00 am. So, when the user enters the bathroom, his geyser is ready to please him with a warm shower of water. That too without making him wait. Users also have the option to undo this by selecting Override key which would then immediately start heating water to the preset temperature. Air2Heat geysers use the world-class and highly efficient component in its construction. It uses r134a refrigerant which is not just efficient but also environment-friendly. Given its more than a century-old experience in dabbling with the hardware, AO Smith’s compressor used in Air2Heat is an industry leader renown for durability and performance. They use Poly-urethane-foam (PUF) insulating layer which provides a good insulating layer to cut down the heat loss. Polyurethane is one of the subtypes of polymer class with an excellent insulating property. It is the same element used in the car’s seat to prevent engine’s heat to reach the seat. Thus, the PUF insulation helps to keep water in a heated state for a prolonged period. AO Smith is one of the largest and oldest water heater manufacturers with 15,000+ employees at its disposal. That is the reason why offices and outlets of reputed organizations like Goldman Sachs, Procter & Gamble, McDonald’s, Pizza Hut etc use water heating solutions from AO Smith. The strongest point for AO Smith is their immense experience in water technology and selection of high-quality components in assembling the water heaters. Another major plus is that AO Smith has been the pioneer in water heater innovations. Patented Blue Diamond Glass Coating and concept Air2Heat heaters are the living examples of that. The downside of AO Smith would be a lack of stunningly designed geysers—something like Adonis offered by Racold. Also, AO Smith presently doesn’t offer gas water heaters which are slowly gaining popularity amongst Indian consumers as they are more efficient than electric water heaters. But if you are someone who is looking for a quality electrical water heater or, alternatively, willing to try out Air2heat—a new concept heater, then Air2Heat AO Smith should be your definitive choice, even if it means you have to shell out a few more bucks.